Do you send emails in English? Do you receive emails from native English speakers and wonder what some of the email abbreviations mean? Hundreds of modern email abbreviations and acronyms go in and out of fashion constantly and while researching this post I was surprised how many I didn’t know. Here are some common email abbreviations that we often use in work emails, instant messenger between colleagues and text messages. 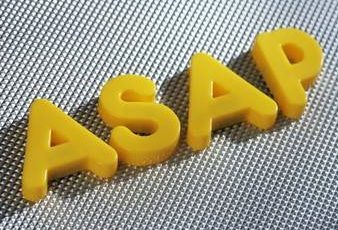 Americans tend to pronounce this as “aisap”, British people tend to pronounce all the letters individually. In the email abbreviations below in this list, all letters are pronounced individually. This is really good when messaging colleagues or friends. When you’re having a conversation on instant messenger and need to break off suddenly, for a delivery or a phone call, BRB tells the person all they need to know in a second. It means, as an aside, to start a new topic. Quite informal and good for messenger. It should be about a 40 minute drive so our ETA is 3pm. Often this is used sarcastically so this can seem a bit rude if used incorrectly. In my opinion, FYI is almost a filler and doesn’t really add more to your message. If in doubt, it’s best to avoid this because it can seem abrupt. On Facebook native speakers will often use IMHO which can stand for “in my honest opinion” or “in my humble opinion”. Super casual! If it’s really funny this can be LOOOOOL. Do you have a friend who likes to send funny emails? NSFW means you shouldn’t open it at work, the content is inappropriate. This is a nice one – often used at the top of an email or letter. Parlez–vous français? If you don’t speak French this may be totally different in your language. It just means “please reply”. Don’t just ignore the invitation and assume the sender knows whether you’re coming or not! Like the two below, this is very casual and well suited to instant messenger although you could use it with colleagues. A friendly and casual sign-off to a messenger conversation. Want to know more about email writing in English? Learn how to start and finish emails in English and some ideas for conversational openers in opening lines in business emails. Hungry to learn even more email abbreviations? There are even more in this article aimed at sales and applicable to general business English here.